Bitcoinsolve claims to be a company founded in 2011. It allegedly is trading stocks and shares. It is allegedly so profitable, that you can invest with it and get your share. There are several investment plans with maximum returns about 100% in a month. So, can you really double your money every month with Bitcoinsolve? Bitcoinsolve is not a real company and it does not real stock trading. It is just a Ponzi scheme, which means an illegal financial game. They take money from the public and they might pay some profits at the beginning, but they will use new deposits for this. Because there are no profits from a real business activity or financial trading. It goes without saying that no legit business can double your money every month forever. Only scams promise such numbers. As you can guess, this type of scheme always fail in the end, because there will always be a day when deposits will no longer be able to cover withdrawals. Bitcoinsolve claims to be a legit company registered in the UK and in the US. But it is not true. In the UK it only has a tax registration (Scure Investment) that almost anybody can get. But it has no licence from the FCA, which is required for investment companies, so it is operating illegally. Concerning the US registration, Bitcoinsolve provides some information about Bittrex, see our image, but it has nothing in common with this crypto exchange. And all the important contact information is missing on the Bitcoinsolve website. 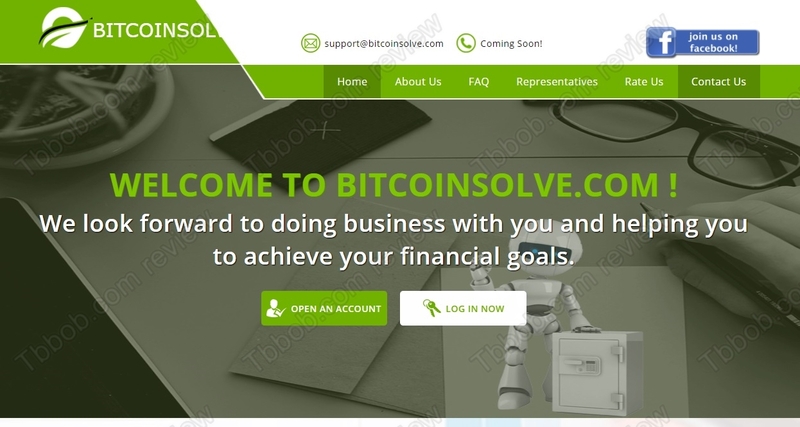 And there is one more lie on the Bitcoinsolve website, it certainly was not founded in 2011. Their own registration shows 2017, meanwhile the website was launched only at the end of 2017. Bitcoinsolve is a Ponzi scheme that is going to fail sooner or later, that is given by the nature of this program. Stay away from it! If you are interested in financial trading, don’t count on free profits, you will have to learn and build yourself a proper strategy. You can try and do that on a free demo account. It doesn’t matter if it is paying now, the point is that it will stop paying one day, it can come any time. Because it is a Ponzi scheme, and this type of scam always collapse. Please read the review to see that a tax registration means absolutely nothing. An investment program has to have a license from the FCA, but Bitcoinsolve is not registered with the FCA, so it is illegal. You can contact the Financial Conduct Authority (https://www.fca.org.uk) and they will confirm this to you. Please sir, which one then is not a ponzi scheme or that which will soon stop paying. Because all your reviews are just the same for all the companies you talk about! That’s the reality, there is no free money, every program offering several percent, or even one percent per day, are scams. We are not saying that they are not paying, we are saying that it is a scam, a Ponzi scheme that is doomed to collapse sooner or later. It is an illegal scheme, the company says it based in the UK, but it has no investment licence from the FCA, so it is an illegal operation, please read our review again. So your story about an US office is not trustworthy, sorry. I encourage anybody interested to check Bitcoinsolve with their national financial regulator. You don’t have to trust us, trust authorities in your country. All is one big fraud!!!!!!!!!!!!!!!!!!!!!!!!!!!!!!!! I invest 200 bugs I did not se at penny. big big fraud!!!! !